The Dubrovnik archipelago islands are exceptionally beautiful. Island Lokrum is under special protection as a nature park, island of Lopud with it s natural sandy beaches and many others will take your breath away. En route you will see charming fishing villages with old monasteries and castles, untouched nature and stunning caves. 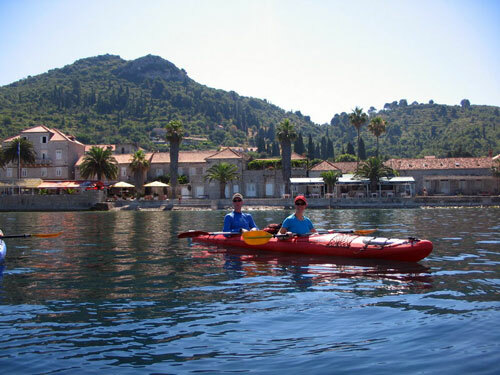 This new sea kayaking tour along the coast of Croatia is an opportunity to experience and explore the fascinating Dalmatian coast, green wooded Elaphite islands, clear Mediterranean waters, and the region's history and culture in a safe, healthy, active way. Explore Dubrovnik and the islands of: Lopud, Kolocep, Sipan, Ruda. We host our travelers at local private accommodation providers, or small family owned hotels. Overnight in private accommodation enhances the visitors’ experience, since you get an opportunity to be welcomed by a local host and thus get better insight in everyday life of local people on Croatian islands. Also, in this way you are contributing to the local economy. While kayaking we stop for a lunch in local restaurants giving you the opportunity to taste some of the typical specialties of the region. The food in the local family owned restaurants is produced organically where possible - they are supplied with fresh fish from local fishermen and vegetables from local farmers. We use well equipped kayaks, mini van, lifeboat, and above all, good local connections and know how. Our Croatian partners are a great group of enthusiastic people who grew up at the sea and with nature in and around Dubrovnik, enabling them to offer you great services with a local touch. Rates include*: Accommodations, 7/4 breakfasts (depending on the package), 1 lunch in local restaurant, 2/1 dinners (depending on the package), 6/3 days kayaking (depending on the package), all equipment, ferry tickets, transfers as indicated. PLEASE NOTE - In case of unfavorable weather conditions we reserve the right to change the itinerary. Transfer from Dubrovnik airport or pier to Dubrovnik, free time in Dubrovnik until the departure by ferry to the island of Lopud where the guests are welcomed by their guide. Overnight in Lopud. After breakfast we gather at the beach and start with first instructions in shallow protected bay: the guide will explain safety procedures and give the tips on paddling technique. We start paddling along the outer scenic side of Lopud to sandy beach of Sunj – located at the other side of the island. There we will stop for swimming and traditional local game 'picigin'. Afternoon is reserved for exploring the island on foot. Dinner and overnight in Lopud. After breakfast we take a 20 minutes pleasant walk to Sunj from where we paddle to the island of Kolocep. We paddle along outer side of the island, along the green forests touching clear water, breathtaking steep cliffs, caves and stunning rock formations. We will stop for a swim and there will be some free time to explore the island on foot or relax on the beach. After lunch in local restaurant we paddle back to Lopud. Overnight in Lopud. After breakfast, we spend the morning paddling across Kolocep Channel to mainland, Trsteno with many small caves and secluded beaches. We visit Trsteno Arboretum with its Renaissance garden and the 15th century summer villa. Then, it’s time for lunch, swimming, snorkeling and relaxing. In the afternoon, we paddle to Lopud. Overnight in Lopud. Ferry* Dubrovnik-Lopud, where you will be welcomed by your guide and your local host. (Free time to visit Dubrovnik is depending on your arrival flight schedule. We will assist you with luggage storage and transfers). Overnight in Lopud. After breakfast we gather at the beach for instructions in shallow protected bay: the guide will explain safety procedures and give the tips on paddling technique. We start paddling from the bay of Lopud and continue along the outer scenic side of Lopud with cliffs and caves to sandy beach of Sunj – located at the other side of the island. There we will stop for swimming and traditional local game 'picigin'. Afternoon is reserved for exploring the island on foot. Overnight and dinner in Lopud. After breakfast, morning paddling across Kolocep Channel to mainland, Trsteno with many small caves and secluded beaches. We visit Trsteno Arboretum with its Renaissance garden and the 15th century summer villa. Then, it’s time for lunch, swimming, snorkelling and relaxing. The afternoon, we paddle back to Lopud. Overnight in Lopud. Cross the island to Sudjuradj, fishermen’s village nested in a scenic bay, with numerous historical monuments, castles, churches and Renaissance summer manors. We arrange transportation of your luggage from Lopud to the accommodation in Sudjuradj, island of Sipan. Dinner and overnight in Sudjuradj. We take the local bus to Sipanska Luka from where we paddle to Sudjuradj, along the inner side of the island passing near small islets and bays where the green pine trees are touching crystal clear water. Overnight in Sudjuradj. After breakfast we paddle from Sudjuradj to the islet of Ruda. En route you will see lovely landscape with coves and islet of Ruda with its Mediterranean machia. We stop for a swim and visit the Green Cave. In the afternoon we explore this beautiful island on foot. Pace: Guide to kayakers ratio 1/8. Moderate fitness level required. 3-6 hours paddling per day. 7-20km per day. Our priorities are your safety, comfort and enjoyment. Our tours are accompanied by qualified and experienced staff. We are fully permitted and licensed in the areas we paddle in. Our guides are always in your close proximity. They are well equipped and trained to handle emergency situations. Emergency logistics are always in background if they are ever needed. Before you start paddling, the guides explain safety procedures and provide comprehensive kayak orientation. We love our region and our work and we hope to share this enthusiasm with you. You will find us friendly, professional and wanting to satisfy your particular kayaking needs. We constantly strive to improve and offer you more. If we can be of any assistance for you with travel details, accommodations, etc please contact us any time. Our guides are aware of their surrounding and they are constantly providing the travelers with suggestions of how to minimize potential negative impacts to the environment and marine ecosystems. We observe marine life but we do not disturb it. Our company strongly supports slogan is: Help Us Keep the Adriatic Clean. We keep our groups small. Thus, any impact on the environment is minimized. Dubrovnik has a Mediterranean climate marked by cool, wet winters and hot, dry summers. Spring is pleasant and sees temperatures gradually increase. Summertime is usually warm and dry. This time of the year is usually pleasant. However, mind the Bora wind that blows cold gusts usually starting in October. Winters still see plenty of sunshine despite temperatures dropping. However, winters are know to be mild in the area. The shallowest part of our sea is in Istria, where the depth does not exceed 50 meters. From Pula, the seabed mildly drops, making a long, narrow valley which extends from Zirje towards Italy which is called Jabucka kotlina. The biggest depth there is about 240 meters. From Jabucka kotlina, the bottom rises to Palagruza reef where the biggest depth is 130 meters. Towards the south, the bottom drops steeply towards the Juznojadranska dolina, where the biggest measured depth is about 1,300 meters. In the Adriatic, the high and low tides have relatively small amplitudes. In the southern part, the difference is rarely above some 40 centimeters, while in the northern part it is somewhat bigger, so that it comes to 1 meter in Istria and the Gulf of Trieste. In some narrow channels and bays, the high tide can grow considerably during a strong sirocco. Currents are weakly observable in the Adriatic. The speed of currents changes in particular areas, but it also depends on time periods. The average speed of currents is about 0.5 knots, but they can also reach the speed of 4 knots. The Adriatic Sea has a very marked annual change of the surface temperature. The average annual temperature is 11C. During the winter, the sea is the coldest and the surface temperature is about 7C; very seldom, it can drop below that too. In the spring, the sea becomes warmer, and the surface temperature rises to 18C. In the summer the surface of the sea reaches a very high temperature, of up to 22 to 25C, and in the southern Adriatic and Istria up to 27C. Hiking shoes: 1 pair (these can be city walking shoes or running shoes). Snorkeling gear- If you are an avid skin diver or want to spend a lot of time in the water we recommend that you bring your own mask,, snorkel, fins, neoprene booties and gloves. Casual Travel Wear- No fancy clothing is needed for our dinners. Your casual pants, skirt, a T-shirt or a blouse will be perfect. For the 8-day itinerary, the first 3 nights are spent in Lopud and the 3 following nights are spent in Sudurad. For the 5-day itinerary, all nights are spent in Lopud. Private guesthouse on the islands are licensed and approved for tourists. Rooms are typically shared, with two people per room. Rooms are simple, comfortable, and clean, with private bathroom, bed linens, and towels. Guesthouses are conveniently located. Everything is within walking distance. All accommodations have Wi-Fi and offer the possibility to do laundry. All breakfasts, 1 lunch and 2 (or 1 depending on the package) dinners are included in this trip. While kayaking we stop at typical local taverns and restaurants for lunch. The food is delicious and the prices reasonable. These are usually small family owned restaurants that offer traditional local food. Meat, fish and vegetarian options are usually available. There are also grocery stores where one can buy a sandwich as well as small markets with local fruits and vegetables. We can cater to special diets and dietary restrictions. The clients just need to indicate their dietary requirements in the booking form and we will advise the restaurants.